With the release of InkyBlackness - HackEd, this deck package has become obsolete and will be discontinued. This release only adds this notice to the relevant readme files. Usage of programs from the deck package are discouraged from now on. Please refer to the development of HackEd and read about it on the systemshock.org forums. Quite late, it was detected that key shortcuts (needed for copy/pasting text) were not working under MS Windows. Turns out, key names are uppercase there, contrary to lowercase under Linux. Now it's easy again to extract and insert messages from/into the editor. Reversed mouse wheel: The slider and texture selectors now move right when scrolling "up". A command-line option exists to revert to the old behaviour. Keyboard shortcuts for edit modes. The modes are now associated with F* keys. The combo-box to select them shows the associated key in brackets. In level objects mode, the right panel shows X/Y/Z information for the tile under or nearest object next to the mouse cursor. For tiles, the floor height is shown. Level control mode has now two level texture selection lists, to make it easier to differenciate which textures are available for walls only. Icons and paintings received extra properties to select the actually displayed frame. The main point of this release is the support for "High DPI" devices - i.e., screens with a high resolution, such as 4K screens. Up until now, the editor (shocked-client) only looked good on "regular" monitors, such as with a vertical resolution of 1080 pixels. Higher resolutions caused the content, especially the text, to become too small and unreadable. Now, shocked-client supports a new command-line parameter: --scale, which is a floating point value between 0.5 and 10.0. Defaulting to 1.0, it creates a UI as before. A user with a 4K screen might want to pass 2.0 or even 2.5 for a good viewing experience. The tool hacker is being reworked. As an immediate effect, it now supports "readline"-like input. Commands can be auto-completed with tab, as well as finally supporting a command history (cursor-up). The diff command has been simplified internally, and lesser used commands like query being removed completely. More to come with hacker. 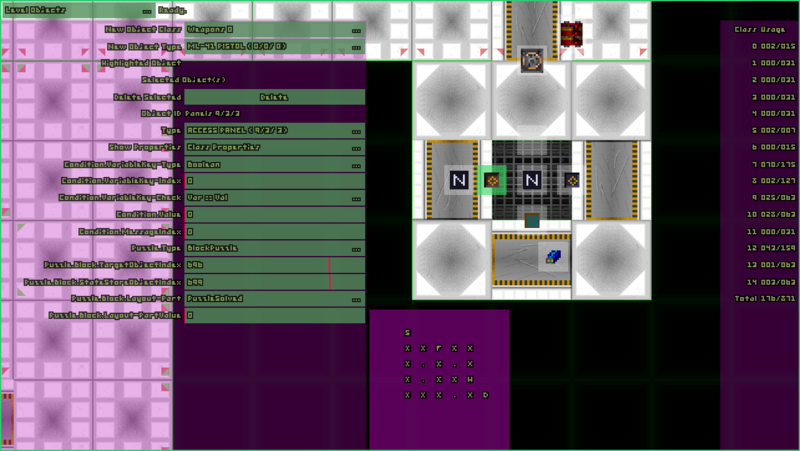 reactor-rng is for patching save-game files that have been created by versions of "System Shock Enhanced Edition" with a static code for the reactor. Running this command-line tool on save-games will set the code to a new, random value and apply it where needed on Citadel. This release marks a milestone for the editor package. After several years in the making, it is a checkpoint for the project, as well as for me. The main editor. An OpenGL based editor in the style of classic 2D top-down editors. Helper utility to create empty archives and resource files. A simple tool to import and export resources. Not all formats are supported, yet, if the proper ID is known, it still allows more access to the resources than the graphical editor. The original tool with which a lot was cracked. Allows low-level modification on byte level, with the potential to crash the engine. There are some editing capabilities missing, such as modifying video mails or cutscenes. Some details on level objects are also not yet unlocked. This is partly because of missing information on the structures, as well as too much effort (for now) without any demand for it. If a mod is in the works and requires further features, they most likely will be provided. Otherwise, it's just an optional exercise. First, a block puzzle editor, which was the last major item missing for creating regular level mods. And second an extension to the save system. Up to this release, the editor would auto-save changes after 5 seconds of idle time. Now, this time can be changed by passing in a new command line parameter. In addition to this, a key shortcut has been added to manually save any changes (Ctrl+S). Additionally, details on various level object properties have been refined and brought to the newest documented state. Instead of configuring "darkness" per tile, now the "light" values are configured (number range simply inverted). This then matches the light configuration of the action. Light action modified to read "On" and "Off" states instead of "Add"/"Remove". Linear gradient light type removed - couldn't be brought to work anymore. Better ranges for the timer action. The effect type property of the "Change Effect" action had wrong enumeration values. This is is fixed. v0.10.4 Door properties and "various messages"
"Various messages" added to texts mode; From these messages the door-lock messages are picked.